Believe it or not, most of the local Escondido-based high school football squads will have played a minimum of four games once this week’s slate has been completed. And just think, we’re not even midway through September but with the season’s start having been greatly accelerated by a quirky circumstance, that’s the reality of things. So let’s take a look at the prep landscape as it currently stands. After an opening night loss, Classical Academy (2-1) has rebounded quite nicely with impressive wins over Montgomery and O’Farrell Charter (56-0). The latter victory was spearheaded by quarterback James Duncan who tossed three touchdown passes while shifty running back Damian Castenada amassed 180 yards on the ground in addition to finding the end zone on a paydirt run. On the defensive side, Caden Goodman registered 4 tackles for loss including 2 sacks while Calvin Vanderleest was even more dominant when he produced a 4-sack night. 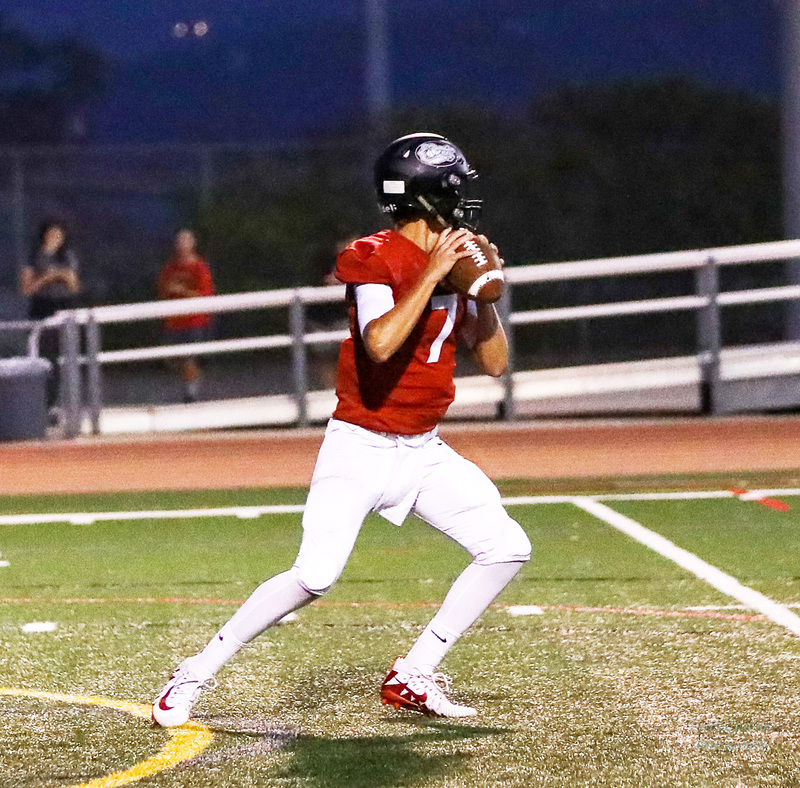 Right now, the Caimans of coach Jon Goodman are riding a wave of momentum and find themselves in a good place as they prepare to take on neighbor Escondido Charter this coming Friday night at Orange Glen High. Speaking of Charter, the White Tigers (1-3) had genuine reason to celebrate when they bested Hamilton (Anza, CA.) 30-20 last week which ended a 15-game losing streak that reached back into the 2016 season. It hasn’t been the easiest of times for EC but coach Greg Brose has kept his charges upbeat and it was gratifying to see their commitment finally rewarded. What’s most encouraging about the White Tigers is that their offense is starting to show some teeth, having put 26, 35 and 30 points up on the scoreboard. Charter will still play the role of decided underdog in its confrontation with Classical but it seems as if a meaningful corner might have been turned. Calvin Christian (2-1) showed its character and resiliency by shaking off the effects of a one-sided loss to Sage Oak with a bounce-back 58-28 win over Warner. With an offense that can detonate at any time, the Crusaders still remain a real championship threat in the 8-man circuit. Meanwhile, there’s been a real ebb and flow to Escondido’s campaign thus far. Solid triumphs over Hilltop and Chula Vista have been counterbalanced by losses to Mira Mesa and Poway. But anyone who’s taken a close look knows that the Cougars are making bona fide headway under the tutelage of Jud Bordman. The Cougs will kick off their Valley League slate this Friday when they meet Fallbrook. Playing at home should help facilitate a victory that could springboard Esco towards more success in the upcoming weeks. There can be no argument that Orange Glen (3-0) has been the talk of the town so far. With many not knowing exactly what to expect, Jason Patterson’s bunch has been particularly dynamic on the offense end, scoring 45 points against Clairemont before exploding for 47 more against Hoover. In running back Cael Patterson (480 rushing yards, 8TDs), the Pats have a certifiable stud who can dominate a game. Quarterback Ethan Villalobos and backfield mate Ruben Ramirez (179 yards) are also capable of troubling an opponent. As for the defense, it’s anchored by productive captains Julien Lesa (12 tackles) and Carlos Galan (4 TFL) and a true disruptor in end Ulises DeLeon (8 solo tackles, 3 TFL, 4 sacks and 2 hurries). This week’s Battle for the Bear rivalry game with host San Pasqual might go a long way in determining just how good the Pats can become. Finally, there is 2-2 San Pasqual. Last week, the Golden Eagles undertook the supreme test when they traveled south to meet the No. 1 ranked team in the San Diego Section, Torrey Pines. Though SP had won two of the previous three meeting between the teams, matters didn’t go well for the visitors as the Falcons unleashed a potent back in the person of Mac Bingham who scored thrice and rushed for 154 yards as the hosts rolled to a convincing 35-0 win. That marked the second time this season that SP had been blanked, the other being a 23-0 whitewash suffered at the hands of Rancho Bernardo. Despite the setback to TP, the Golden Eagles should benefit from going up against such a formidable foe and incorporating the lessons learned from battling such as elite opponent. Moreover, it should not be discounted that Tony Corley’s group looked really good in convincing wins over Sweetwater (48-7) and Westview (23-0). Corley’s team’s are known for their ability to run and bring a certain physicality to the task at hand. This week’s intriguing tilt versus a surging Orange Glen team should provide a good barometer to gauge exactly in what direction SP is heading.